Up to four different HD videos can be cropped from a high-resolution, wide-angle 8K image, and each cropped image can be panned, tilted and zoomed individually, enabling the single 8K ROI camera to serve as four HD cameras. A multiple of 8K Multi-Purpose Camera units (maximum of eight units) can be connected and operated as one integrated system. By linking a crop area in one camera to multiple crop images in other cameras, pan, tilt and zoom on the multiple crop images operate in link with the panning, tilting and zooming on the main frame. The automatic wide-angle distortion correction function achieves natural-looking images even in the videos cropped from the frame periphery. The camera control unit is alternately capable of outputting the full 8K image (as 4x 12G SDI feeds) usable for 8K ROI replay systems such as those provided by Fletcher Chicago at Super Bowl LIII. The 8K ROI multi-camera system improves operating efficiency and reduces operating costs in live events and sports recording or broadcasting. The system helps to reduce camera setup, relocation and transport costs. It also eliminates the need to take up audience seats for the setup of multiple cameras. 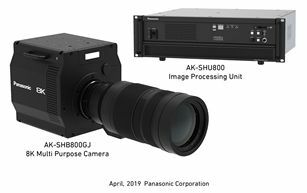 Panasonic has been developing 4K/8K equipment and systems toward practical applications in 2020. The company continues to contribute to the further development of the broadcasting industry by helping broadcasters and video producers to acquire high-quality images and improve operating efficiency. 1. Up to four HD videos can be cropped from a single high-resolution 8K camera image. 2. Pan, tilt and zoom operations can be linked to multiple cameras (up to 8 units). 3. The automatic wide-angle distortion correction function removes, in real time, distortion of images cropped from the image periphery. *1: Made-to-order product *2: An optional AK-SFC101 Software Key is required.